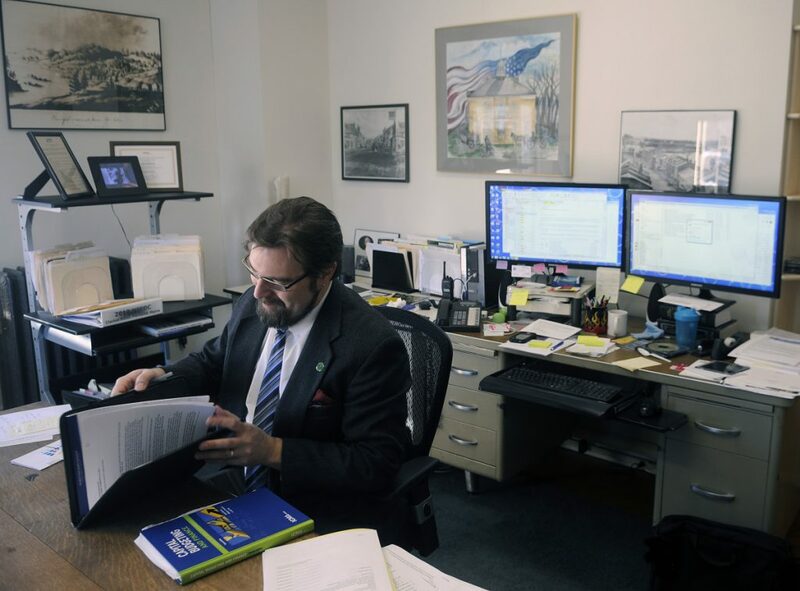 An assessor's agent said he and city officials worked behind the scenes to issue 'proper' tax bills, while city officials want the assessor to look at the budget before it's approved. HALLOWELL — Errors worth hundreds of thousands of dollars in municipal budget and tax calculations have been confirmed by city officials, who now want to change the way the spending plan is built to avoid similar mistakes in the future. The Finance Committee, a three-person City Council committee chaired by Councilor George Lapointe and including Councilors Kate DuFour and Lisa Harvey-McPherson, discussed the errors publicly Monday night with City Manager Nate Rudy, Treasurer Dawna Myrick and the City Assessor’s Agent Rob Duplisea of RJD Appraisal in Pittsfield. The city assessor’s agent did not review the budget until after it was approved by councilors this year. On Aug. 13, the City Council approved $5,856,582 in expenditures and $753,854 in revenue. Duplisea confirmed that errors in the city’s tax commitment sheet were discovered and amended before tax bills were sent out. In a draft plan for the next budget cycle, a thorough review by the assessor will occur in May before the final City Council reading, scheduled for June. That review, which this year didn’t happen until after the council approved the budget, will result in a draft of the tax calculation sheet for councilors to have. “Moving forward, I’m happy to be able to make corrections to our process and error-proof it,” Rudy said, calling earlier review by the assessor “an explicit statement” about this year’s mistakes. Rudy said last week that $150,000 in carry-forward revenue was not included in the revenue budget approved by the City Council on Aug. 13, and about $253,040 in revenue was double-counted on the city’s tax rate calculation sheet draft by Rudy to illustrate the tax rate. Because some of the money was not counted while some was double-counted, the errors reduced their own effect to about $103,000 on the draft sheet. Rudy said the carry-forward was simply omitted because city officials were “really focused” on achieving a flat tax rate — which they did — and simply forgot it. The tax rate calculation sheet requires three numbers also included in the city’s internal revenue budget be taken out and counted separately. These numbers are all state-decided, homestead exemption, business equipment tax exemption (BETE) and state revenue sharing. The city included these numbers in their expected revenue, which is also plugged into the sheet. The city’s carryover was omitted from the total revenue, so the effect of the errors was reduced. Rudy credited Duplisea with finding all of the erroneous calculations in the sheet and determining that the city’s revenue budget was lower than normal. “I want to be very clear that in no way, shape or form do I attribute any budget errors whatsoever to Rob Duplisea,” he said Monday. “It’s not official until Rob fills it in and signs it,” Rudy said. The tax rate did not change from the city’s estimate because the current rate of $19.70 per $100,000 of property valuation fits within the ranges of minimum and maximum tax rates on both the draft sheet and the actual one. The only thing that changed was a reduction in the amount of budget overlay — a municipal cash reserve in case property tax revenue is lower than expected — from $56,888 to $39,529. Rudy said the errors would be covered by an increased amount of carry-forward revenue from last year’s budget. Instead of the $150,000 figure forgotten in the third reading of the budget, the city is carrying $225,000 forward into the next fiscal year to keep the tax rate the same. That money coming out of funds that the city already had left over from last fiscal year. That money, had it not been carried forward, would have fallen into surplus. A new revenue budget will be presented to the council in October. Rudy said the only change to that budget will be the addition of the carryover, resulting in a revenue budget of $978,584. Rudy said the Finance Committee probably will just implement the new process, instead of the City Council taking formal action. The Finance Committee said in the Sept. 7 memo that it supported training for Rudy and Myrick to prevent similar errors from happening in the future.